When I was planning my most recent Daring Cooks challenge, this salad immediately popped into my head to serve on the side. It's another one of our favorite Thai dishes, but I feared that it would be time-consuming and high maintenance. Happily, I was wrong! 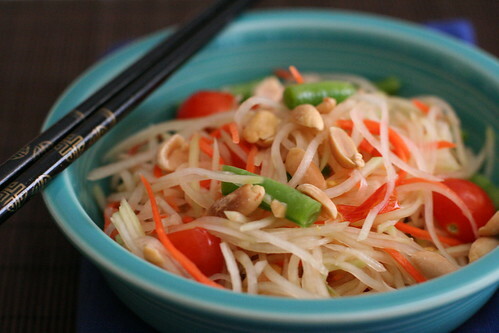 The biggest time saver was the pre-shredded green papaya and carrot mixture that I bought at our local Asian market. Since the manual labor was already done for me, this came together in literally 2 minutes. If you've never had this delightful salad before, it's tangy, spicy, and radiates freshness. I wasn't familiar with palm sugar before I made this salad. I found it in a heavy solid round block at my Asian market, and found that the best way to handle it was to grate it with my Microplane. Do you know any other interesting recipes that use palm sugar? 1. Crush garlic, tomatoes, green beans, and chiles with the back of a spoon in a large bowl just enough to bruise. 2. Whisk together fish or soy sauce, lime juice and palm sugar, and add to the bowl. 3. Add green papaya and toss well. Top with crushed peanuts. I used to get this at the Laotion store I used to visit.It was made by a laotion woman right in the store. It was the salad I hated to love. Upon first taste I didn't think I liked it but I was drawn in. Now I crave it. I live in Thailand, and this is one of my most favorite dishes to eat in the market during the hottest months! OMG I can't believe it's papaya! I thought it was noodles! Looks phenomenal!! yum!!! I ate this at least once a day when we were in Thailand. It's great with salted eggs and sticky rice! Your photo is perfect. My mother brought some papyas at home and it has been staying in the fridge for days. I haven't thought what to do with them not until this post! Thanks. looks SO good!! I sent you that eggplant recipe I adapted from Shaheen/Purple Foodie, right? It has palm sugar in it. really, really yummy. this was one of my favorite recipes from my trip to south east asia-- yum!! Amy! Really, how could you not with such an amazing looking salad!